Etisalat which is now known as 9mobile recently made some adjustments to it's data plans. 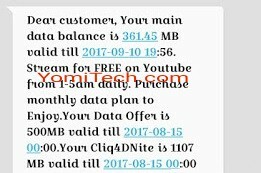 Now subscribers using 9mobile morecliq are always given "Free Cliq4DNite data bonus". What this means is that eligible subscribers will be granted "free access to stream on YouTube" without any hidden charges. I don't know if this is their own way of compensating their customers for the recent poor network coverage or maybe its just their own way of luring people to purchase their pretty high data plans, but either way, I think this is a good development. Although this has been on for quite some time now, a lot of people are not aware. Also note that this free YouTube streaming is only available to eligible users and it's available from 1AM to 5AM. Note: The free YouTube Streaming data is capped at 1Gb and available from 1Am to 5Am. That's all guys. If you have any question, feel free to ask and also don't forget to kindly share this post on your various social media platforms.